Web of Science: What rocks are found almost exclusively in Iceland or possess qualities unique to Iceland? Igneous rocks are classified on the basis of two independent variables, the chemical composition of the magma from which they crystallised, and the external conditions of crystallisation - fast or slow, at the Earth’s surface, in water, or deep within the Earth. Chemically, rocks in Iceland reflect their origin at a hot spot in the middle of the ocean. Another such hot spot - they are 25-30 in all - is Hawaii in the Pacific Ocean which is characterised by many of the same types of rock as Iceland. There is, however, one interesting exception: silicic rocks (dacite and rhyolite) are much more common in Iceland than in Hawaii, where such rocks are almost totally absent, and in fact Iceland is probably quite unique among oceanic islands in this respect. Chemically, therefore, Icelandic rocks are similar to those of other oceanic islands - and some continental basalt regions, too - but the ratios of the different rocks are in some ways unusual in Iceland: by far the greatest volume is basalt (90%), then come silicic rocks (rhyolite and dacite, 6-10%), whereas intermediate rocks (called icelandite!) are relatively scarce. 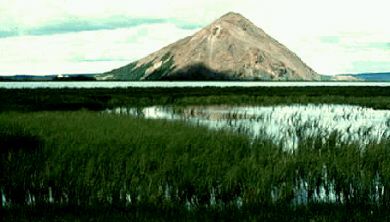 Mount Belgjarfjall or Vindbelgjarfjall in Iceland is a palagonite ridge. Contemporary eruptions of this type have been observed and investigated at Katla 1918, Surtsey 1963 (submarine), and Grimsvötn (1934, 1996, 1998). The rock called palagonite forms the following way: 1100-1200°C hot magma is chilled in water, forming a pile of tuff (hyaloclastite - shards of volcanic glass containing whatever crystals that were present in the magma at the time of eruption). This waterlogged tuff pile heats up due to percolating water carrying heat from underlying pillow lava, intrusions, etc., and the volcanic glass, being very unstable and reactive, becomes partly devitrified at 80-150°C to form various minerals - the clay mineral smectite, zeolites, calcite, opal - that transform the loose pile of tuff into a hard rock called palagonite. Probably the rock type that comes closest to being typically Icelandic is palagonite. Well known palagonite hills in the vicinity of Reykjavik include Helgafell, Hengill, Bláfjöll, and the ridges in the Reykjanes Peninsula. Sigurður Steinþórsson. „What rocks are found almost exclusively in Iceland or possess qualities unique to Iceland?“. The Icelandic Web of Science 6.3.2005. http://why.is/svar.php?id=4806. (Skoðað 21.4.2019).